There are great resources available. Find More! Lots of great webinars and other events this month. Check 'em out! History: In 2006, Congress followed the lead of dozens of national, state and local organizations in sounding the call to end dating abuse. Both Chambers declared the first full week in February "National Teen Dating Violence Prevention and Awareness Week." Then in 2010, they began dedicating the entire month of February to teen dating violence awareness and prevention. 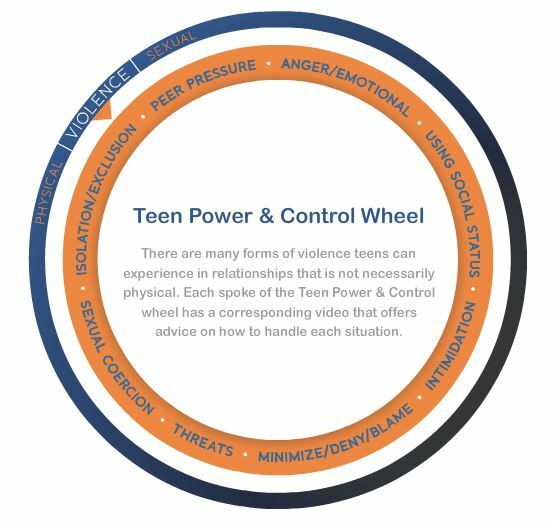 In this newsletter, we've condensed some great resource from LoveisRespect.org (and a few others), to aid you in your work to raise awareness about teen dating violence and promote programs that are working to prevent it. Here in Colorado, there are organizations doing great work on this issue. We can't highlight them all, but please join us for our Brown Bag on February 15th (from noon to 1pm) to hear from Survivors Organizing for Liberation (SOL) and Buried Seedz of Resistance on how engage teens to create a multi-generational community where we can all learn and be taught from any aged person, from our babies to elders. Register Here! Are you hosting a training or event related to TDV awareness or prevention that you want to share with the CCADV community? Post an event on our community calendar! With Valentine’s Day behind us, we’d like to remind you that everyone deserves a safe and healthy relationship. Remember, love has many definitions, but abuse isn’t one of them. If you or someone you know has a question about a relationship, healthy or unhealthy, visit loveisrespect.org or text “loveis” to 22522. What better way to say Happy Valentine’s Day than helping all of your friends learn about healthy relationships? Help distribute the National Respect Announcement on February 17, 2017. Encourage teens to read it in class or youth group, post it to their Facebook wall or share it on Tumblr. However you prefer, spread the word! We LOVE this resource! This interactive wheel (linked to the wheel below- just click it!) illustrates with facts and videos how dating violence is a pattern of abusive behaviors -- usually a series of abusive behaviors over a course of time -- used to exert power and control over a dating partner. Great tool to use with teens. What's the Dish? : Teen DV Month Last Minute Call to Action! That's Not Cool partnered with Break the Cycle, and loveisrespect are excited to present you with our full menu of planned events, activities, tools, and content. If you were unable to the webinar last week, you'll find access to the webinar recording, presentation slides, and relevant materials HERE. Respect Week was developed as a special way to for young people to raise awareness during Teen Dating Violence Awareness and Prevention Month. The activities in this guide are easy to implement students and youth leaders in schools, sports programs, and youth/community groups of all kinds. iPhone App: The 'Love is Not Abuse iPhone App' was launched in August 2011. This free app is an educational resource for parents that demonstrates the dangers of digital dating abuse and provides much needed information on the growing problem of teen dating violence and abuse.Over the course of the experience, you receive text messages, emails and phone calls in real-time mimicking the controlling, abusive behaviors teens might face in their relationships. The app also provides information on warning signs of abuse, concrete steps parents can take if they are concerned their child may be a victim and tips for how to talk to your child about the issue. This webinar will examine the domestic violence prevention work of the youth community action team in Dade City, Florida, the Florida Coalition Against Domestic Violence (FCADV) statewide youth summit, and FCADV statewide youth leadership programs. How to use the tools and materials the NO MÁS website offers to facilitate meaningful conversations among family members about healthy sexuality and healthy relationships. Casa de Esperanza established Youth Amig@s, a program that engages Latinas in high school, creating a space for these questions to be addressed in a culturally responsive manner. With the Rural CCR Project now complete, I have a new role at CCADV: Technical Assistance Specialist. I will be working on providing member programs with technical assistance on a variety of topics; program management, policy development, and core competencies. I’m available to help with any technical assistance/training needs and will continue to assist our members with developing or expanding a community response to domestic violence. I look forward to this challenge and connection with our members and allies. Join us as Survivors Organizing for Liberation (SOL) share work they are doing with teens to educate and empower them to take a stand against dating violence. Learning from the work they do can provide ideas for all of us to utilize during Teen Dating Violence Awareness month and throughout the year. Explore some of the unique complexities of violence against people with disabilities and Deaf people, barriers to access to effective criminal justice and victim services responses for survivors with disabilities and Deaf survivors, and opportunities for change in the field. Attendees will learn about the various rights afforded to victims/survivors as they navigate the criminal justice system. Similarities and differences between health equity and intersectionality, as well the larger structural drivers that influence community determinants of sexual and domestic violence. Appropriate for attorneys and advocates who have participated in a previous LRC training and/or who have some experience with interstate custody cases. Framework, principles, and practices that are necessary to organize and develop a BIP as part of a community’s response to address domestic violence. Unpack the impact of mandatory reporting on help seeking and identify practical strategies advocates can use to decrease negative consequences of reporting and increase survivor safety and self-determination. Learn about innovative ways in which Enlace Comunitario engages young people to develop their leadership through peer-to-peer learning promoting healthy relationships to prevent teen dating violence. This webinar, aimed at adult allies (educators, parents, youth organizations), will provide information and strategies for teaching young people about healthy relationships and how to support one another. Attendees will get a full overview of what UPL is and how to provide effective advocacy without crossing the line/providing legal advice. Do you have an upcoming online training you want to share with the CCADV community? This unique 3-day training summit focuses on the intersection of technology and domestic violence, sexual assault, stalking, and trafficking. Equal Access and Gender Identity Rules Training. Survivors of abuse frequently have tax problems. The tax return is the starting point for understanding those problems and helping the survivor identify a remedy. Check out this great resource from Center for Survivor Agency and Justice. Copyright © 2017 Colorado Coalition Against Domestic Violence, All rights reserved.